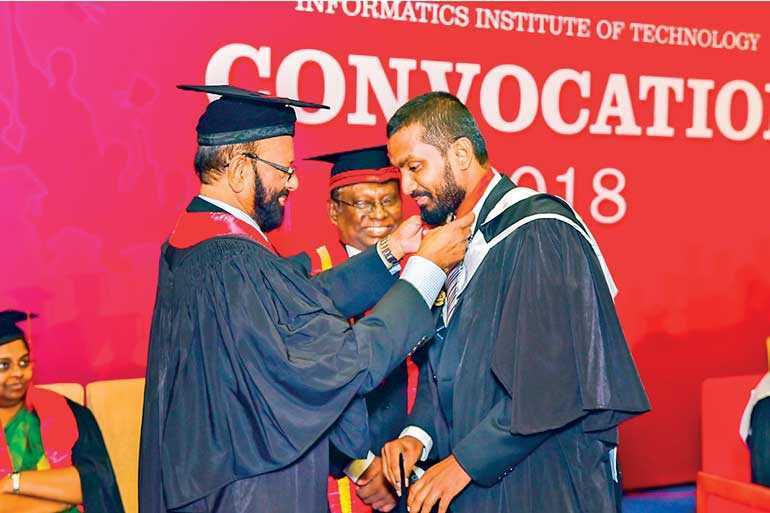 Informatics Institute of Technology (IIT), the pioneer in British higher education in Sri Lanka and the country’s premier IT and Business campus, held its first-ever annual convocation of the Robert Gordon University, UK (RGU). During the event held at the BMICH, degrees were conferred to students who had successfully completed the Master of Science Big Data Analytics of RGU. Prof. Kay Cooper and Prof. Nirmalie Wiratunga of Robert Gordon University (RGU) graced the occasion together with IIT staff and graduate families. After the handing over of degrees, the ‘Dr. Gamini Wickramasinghe Gold Medal’ award for his outstanding performance was presented to Mohomed Shafeek Muhammed Shariq. The convocation also included a unique forum titled ‘Big Data Forum for Data Enthusiasts’ where students and other participants were presented with the opportunity to interact with leading experts in the field of Big Data Analytics. 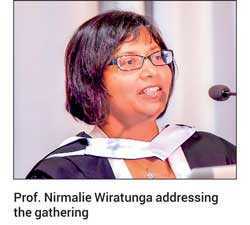 These experts included Prof. Nirmalie Wiratunga from the School of Computing Science and Digital Media at Robert Gordon University, Dr. Ruwan Weerasinghe from the University of Colombo School of Computing (UCSC) and Dr. Dilshan Silva – Head of Analytics of Nations Trust Bank. Robert Gordon University is a dynamic, modern place to study with an international reputation for providing high-quality education from undergraduate through to PhD level. The university has been awarded a Gold rating in the Teaching Excellence Framework (TEF), placing it in the top 20% of the best universities in the UK for the quality of its undergraduate teaching and learning. The MSc Big Data Analytics is a specialist Master’s degree course designed for practicing industry professionals such as Software Engineers and Business Analysts who have an honours degree in Information Technology, Computing or related areas. The courses equip students with significant computing knowledge with focus on modern big data analysis and visualisation methods, text analytics and big data specific programming skills coupled with NoSQL data stores. It provides the technical skills and research training necessary to develop sophisticated data analysis and retrieval systems applied to Big Data Analytics. The modules of the two-year, part-time course include Advance Databases, Big Data Programming, Cloud Computing, Data Analysis, Data Mining, Data Warehousing, Research Methods, Text Analytics and the MSc Project. Informatics Institute of Technology (IIT) was established in 1990 as the first private higher education institute that awards reputed British degrees in the field of ICT and Business. IIT is an award-winning campus offering degree programs from the Robert Gordon University, UK and the University of Westminster, UK. IIT has played a pivotal role in strengthening the IT and Business sectors in Sri Lanka over the years by producing world-class graduates. These graduates have gone on to become successful entrepreneurs and IT/Business professionals in both local and international corporate and government entities. Since its inception, IIT has produced thousands of graduates who have excelled in over 250 organisations around the globe.